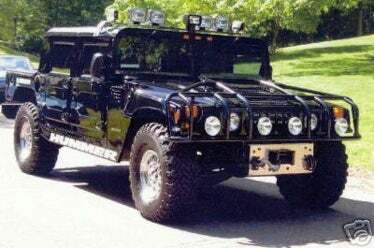 Apparently the '96 Hummer H1 owned at one time by rapper Tupac Shakur is now up for auction on eBay for the bargain basement price of just $200,000. No, seriously — two hundred large. And why wouldn't you want to spend 200 Grover Clevelands (or more!) on a used black Hummer that wasn't even the vehicle 2Pac was rollin' in? Well, how about because it's the same H1 raffled in a contest by BET in the "Picture Me Rollin': Win Tupac's Hummer Sweepstakes" back in 2003. We're also told the winner then ended up selling the Hummer which then it found its way back into the possession of the late, great Shakur's family who are now selling it due to bankruptcy. What? Don't tell me the family's already blown through the "Lost Tapes" money? Full eBay description after the jump. Oh, and did we mention it's only got 14,000 miles on it? What a steal. The 1996 H1 Hummer hard top previously owned by rapper-actor Tupac Shakur is being released for sale to the general public. The hummer, in pristine condition, was raffled in a contest by BET in 2003 entitled PICTURE ME ROLLIN'-WIN TUPAC'S HUMMER SWEEPSTAKES. The winner sold the hummer which now, as fate would have it, found its way back in the possession of Tupac's family. With less than 14,000 miles, the H1 is fully loaded and still in its original condition. Forced to liquidate assets, Havenotz Entertainment has made the Hummer available on Ebay with bidding starting at $200,000. All interested parties may place a bid. Please email with any questions.